Description: Several licenced Fisher-Price books were made during the late 1980's and the 1990's. One of these books was a coloring book with reward stickers titled "The Great Monkey Chase". 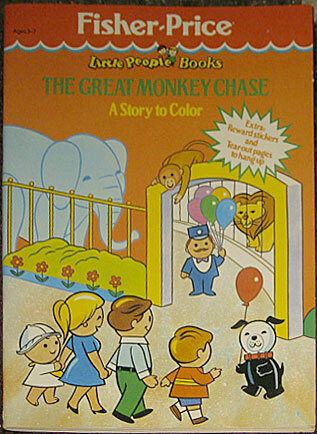 FPT5227 - Soft cover Fisher-Price coloring book with reward stickers titled "The Great Monkey Chase". The book cover has a picture of a Little People family walking up to a zoo gate. The top of the book has a red and blue Fisher-Price awning bar with "Fisher-Price" in the center in white. Back cover includes list of other Fisher-Price Little People Books. ISBN 0-87135-142-0".